PLEASE, DO NOT CARE THE TAX BUT THE TOTAL QUOTE THAT IT IS CORRECT. This stunning Rome apartment measures 190 square meters and compose of 3 comfortable and spacious bedrooms all with king-sized beds mounted with 'Simmons' mattresses, wide and bright living room decorated with a nice and simple taste, wide collections of artistic paintings are hanging by the wall that add colorful touches mixed with a touch of modern style, parquet floors and marble floors, full kitchen with all the utensils that you need, dining room and 2 ample bathrooms both with bathtub and shower to make your stay the most delightful. This property can accommodate maximum 8 persons. This marvelous and spacious 'Belvedere Monteverde' (ex Casa Gianicolense) apartment is located in Gianicolense zone of the Trastevere, away from the crowd and busy streets yet in the historical center, its balcony renders the apartment very luminous as the sunshine penetrates the living room additionally it offers a relaxing place where you can enjoy fresh Roman air and breathtaking panorama of Janiculum. This wonderful apartment is located in central Rome of a residential area on the second floor of the old restored elegant building. 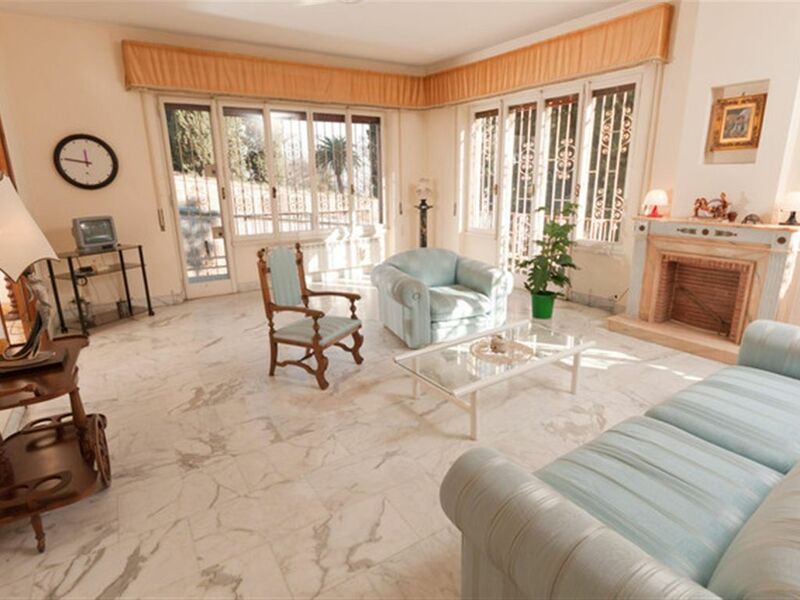 This apartment is ideal to people who love to explore the historical spots in Rome. Just across the street, you will find yourself amazed with the botanical plants and statues of mythological figures as well as a holy corpse at the "Villa Sciarra", one of the most famous gardens in Italy. Piazza Garibaldi is just 10 minutes away, here you will be on topmost part of the Eternal City and you will experience the most beautiful panorama in Rome, and up ahead in few minutes walk, the St.Peter's Square in Vatican City welcomes you. Just a few minutes walk, you will be in the heart of Trastevere and access the Santa Cecilia in Trastevere Church which was built during the third Century. Every footstep is an event, few steps away are Campo di Fiori and Piazza Navona, Colosseo, Circo Massimo, Foro Imperiali and as such, and the famous flea market 'Porta Portese' which is open every Sunday is nearby where you can find rare Roman antics. When you're tired, you can always find public transportations which are interconnected to get from historical center and to the apartment, surely all roads lead to Rome. Bars and all types of restaurants, pizzerias, trattorias are just couple of minutes away, you will surely enjoy Roman life in a simple yet classy way. We even have handful of restaurants to recommend you. Whenever I go to Rome, i always find the neighborhood of Janiculum the very nice and quiet place, ideal for my free time and relax, that's why i bought a property in the said location. Gianicolense is situated in Trastevere and in the heart of the Eternal City and is on top of one of the seven hills of Rome, it's just like staying on topmost part of Rome where just nearby you can experience the breath-taking view of the city and its neighborhood. Living in Gianicolense zone is like living the residential area of Rome away from the hassle of the busy streets of Rome center yet you are in the center of Rome. Telephone service in case of emergency and for incoming call only. We initially provide each member of your party the following: - 1 pillow case - 1 bed sheet - 1 large body towel - 1 hand towel - 1 roll of toilet paper. Off-street free parking area or 2 minutes away by foot from the apartment, fee is between 15 & 20 Euro per night. Secured and guaranteed. Covered garage 2 minutes away by foot. Free Wi-Fi Hi-speed internet Wi-Fi service. Italian basic kitchenware and tableware for max 8 persons. Basic Italian cooking utensils are provided. Surrounds the living and dining areas. Absolutely beautiful apartment in Rome! The host was so helpful and it was perfect for our family of 5! 3 double bedrooms (possiblibility for a 4th I believe) living, dinning spacious, quiet, bright, cheery apartment with elevator. Friendly greeting from one of the agents managing the apartment, he was very informative and knowledgeable. Lovely views from the balconies and windows over Rome. One new full bath, the other old fashioned with a shower head that floods the floor (beware). Kitchen is a bit messy, could use an electric kettle and better quality equipment and supplies, but it was adequate. The kitchen sink faucet is broken, small things that could be repaired for not a lot to make this place a bit spiffier. It's a condo building, owners are on the other floors and enjoy their quiet and privacy so this is an elegant retreat, certainly not the place to party. We had a great time breakfasts all together and out we trouped into Trastevere a residential district packed with excellent and un restaurant and the fables St Maria Church with the 9th century mosaics and the church of St., Cecilia. You need to know that this place is on a steep hill. 120 steps and hilly walks up to the street and no way to avoid that. It's a SHLEP, you need to be fit. One hour (plus) walk to Vatican, same to Capitoline Hill and Center City. Taxis about 25/30 euro to those areas. When arriving at apartment be prepared to pay a tourist tax (levied per person) and the 300 euro deposit required in case of damage, that wasn't anticipated and we didn't have a Pay Pal account so it was cash. Jet lagged as we were this was a bit of a process at the end of a long day. Apart from a few things this is a lovely place. I am so glad that my property helped you get away. Rest assured that I'm doing actions regarding your concerns. As for the Rome city tax (travellers should informed themselves before travelling even to any destination) and the refundable security deposit, please be advised that everything is written on the website even before you have booked the apartment, I have also e-mailed reminding you these extra fees beforehand. Yes, the property is located on the top-part of Rome-Trastevere (like Aventine, Campidoglio, etc.) however the 80 little steps stairs (not 120 steps) is only an optional way. The main economical way (as was told you upon your check-in) to get around the city is by bus #75 which easily can be reached by foot on a flat ground in 2mins from the apartment. Your comment help me grow and rest assured that I am doing actions to provide the best service for my future guests. Very good and comfortable place to stay with family. I am very thankful of you for sparing your time and leaving your wonderful comment. I am as well very grateful of having you as my guests. Looking forward to welcoming you back in the Eternal City on your next visit. Many thanks for the kind review about my apartment, and also thank you very much for having chosen my holiday house in Rome. I am happy that you were satisfied and appreciated everything about it. It would be an honour to host you again in the future. The apartment was perfect even i think it has to be a bit remodelled but overall it is convenient. We spent more than 15 days and it was perfect for our needs: all you need is near by and, thanks to the advise of Andrea, we dine in good restaurants. There is a superb sunny living room. The process of booking and paying for the apartment was very easy and secured. Thank you very much. 4 stars if it was remodelled but in real 6 stars for everything and price. I'm very happy that my apartment made your Roman vacation enjoyable, your comments help me grow and rest assured that I am doing actions to provide the best service for my future guests. The apartment is very spacious and clean, perfect located in the heart of Rome. Bath rooms could be a bit renovated , but in general it is a great place to stay for a vacations or business in Rome. Great vacation. I am very glad to hear that you had nice stay in my apartment and you enjoyed Rome and our recommendations. It was an honor to have you as guests. Thank you for having chosen my holiday house in Rome. Hope to welcome you again for your next visit in Eternal City.